Jade Rude is interested in testing in her work the boundaries between visual perception and physical presence, creating sculptures, installations, and videos that offer spaces of heightened engagement between the viewer and the artwork. Much of her practice draws from theories and statistics related to popular culture, resulting in work that acts out these notions while exploring aspects of how we perceive and process our immediate environment. For YYZ Artists’ Outlet, Rude will create an installation where the viewer becomes integrated into a theatre of art through a formalist exploration of Drer’s solid. The installation will respond to the architecture of the gallery space on aesthetic, conceptual, and practical grounds, incorporating multiple forms made from gold aluminum mirror, arranged in stacked configurations of pyramids and totems that are positioned to lead the viewer on a circuitous path throughout the space. Drer’s solid refers to a truncated rhombohedron depicted in the engraving Melancholia(1514) by the German Renaissance artist Albrecht Drer (14711528). Many historians and mathematicians have studied the form, but its presence in the image retains some mystery. However, an analysis of its cross ratio connects it to the golden meanthe organizing principle famously used throughout the Renaissance for creating balanced, harmonious two-dimensional compositions (also known as the golden section, divine proportion or golden ratio). Drer’s solid, therefore, can be seen as representing the golden mean in a three-dimensional form. Further, German psychologist Adolf Zeising (18101876) wrote in 1854 of a universal law regarding the golden ratio in which is contained the ground-principle of all formative striving for beauty and completeness in the realms of both nature and art, and which permeates, as a paramount spiritual ideal, all structures, forms and proportions, whether cosmic or individual, organic or inorganic; which finds its fullest realization, however, in the human form. 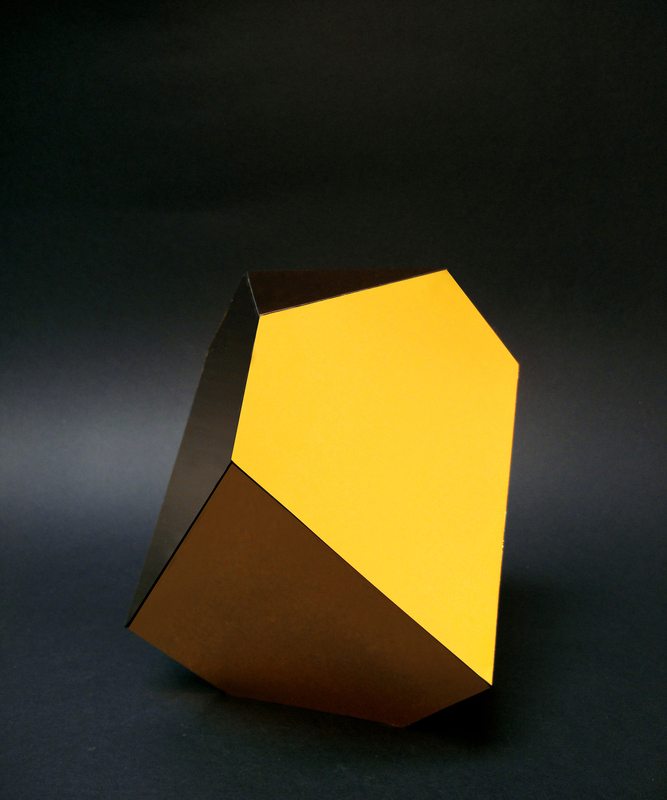 Considering these two notionsthat of the connection of the golden ratio to Drer’s solid and to the human body this installation creates a space for exploring this concept in a three-dimensional space through gold-mirror sculptures not unlike the shape depicted in Drer’s engraving. By interpreting the forms in a reflective surface, the viewer’s body becomes integrated into the environment. In the space of The Golden Solid, the physical body and surrounding architecture become enmeshed. Strong lighting will heighten the drama of the encounter, creating a theatrical space intended to captivate viewers and allow them to become immersed in the confusing perspectival spaces of the gallery. JADE RUDE studied social theory in Norway, Art and Design in England, and graduated from the Alberta College of Art. She works in a variety of media including sculpture, installation, photography, and video. Through a variety of perception-shifting tactics, Rude aims to disrupt our familiar responses to certain objects and in doing so, force a re-consideration of our relationship to the material world. Her strategies are deliberately playful even though they test the very boundaries between visual perception and physical presence. In addition Canada, including a group show at MOCCA, Rude has exhibited in the US, England, Japan, Australia, Columbia, and at MAMBA in Buenos Aires. Most recently she participated in a residency at SVA, New York. Rude currently lives and works in Toronto. Read It’s all in the numbers by SARAH ROBAYO SHERIDAN, an essay published alongside JADE RUDE‘S exhibition. Jade Rude would like to gratefully acknowledge the support of the Ontario Arts Council.